Today I announce the first results of this year's Camera of the Year awards. This award goes to cameras introduced during the 2012 calendar year. 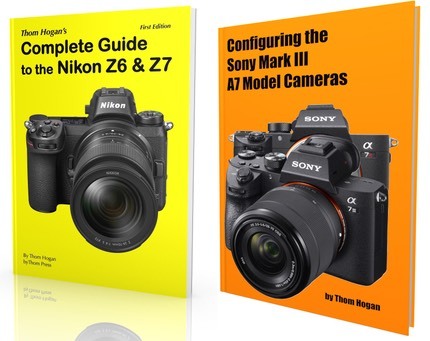 While it's possible that cameras introduced in 2010 and 2011 might conceivably be better than this year's new ones, that's generally not the case, and certainly not the case in this category, as the bar moved considerably from where we were in 2011. Thus, I can say with some certainty, that I believe the winner I chose is right now simply the best overall entry mirrorless camera, period. Note that I wrote "overall." One problem with photography gear is that there isn't a "perfect at everything" product out there. It's very important that you understand what things you need from and value most in a camera, as your pick may be different than mine because your needs are different. I suspect my choice will surprise quite a few people. But I vote with my money (and pocket, where this camera often resides). My winner for 2012 is the Panasonic GF5. Yes, that's despite the lowest pixel count (12mp versus 16-20mp for the others). Yes, that's despite not having features that the others might have (phase detect autofocus, WiFi, etc.). So what then vaults the GF5 to the top? It's the mix of things, actually. It's the smallest of the bunch and has some of the best build quality. Compared to the E-PM2 it's slightly smaller and has a more robust build quality. The hand position tops the E-PM2, too, as does the built-in flash versus add-on flash of the E-PM2. Some might prefer the sensor stabilization of the E-PM2, but that's really only going to come into play if you're going well beyond the kit lens (which implies you might want the other category of camera, Best Serious Mirrorless Camera). Other than perhaps battery and continuous movement autofocus performance, there's nothing that really disappoints me about the GF5, and none of the other contenders top it in those things. The GF5 fits nicely in my jacket pockets with the 14-42mm X lens. The images I get out of it are perfectly fine for up to 11" prints, even larger with some care. There's a no-nonsense quality about it, as if someone actually designed it to purpose, not a list of marketing specs. The iA setting works well enough that I can hand the camera to someone else and expect a decent picture as a result. I've dragged my GF5 through Alaska and Wyoming backcountry this year, plus a far amount of front-country, too. It still looks new, and it's never let me down. Does the GF5 have a drawback? Probably the biggest issue I find with JPEG shooting is that it has a tendency towards a cool white balance. If you're paying attention and know what you're doing, you've got a two-axis ability to move white balance color, which you can do quickly via the touchscreen. So what about the other contenders? I wanted to like the Canon EOS M, but ultimately, it does disappoint me in several ways. Like the GF5, the body design is rugged and straightforward, which was a great start. But with the kit zoom, it starts to be a fairly large camera by comparison and it's not really delivering on many of its promises (phase detect autofocus, for example). If I did more high ISO work the EOS M would have a bit more impact, but the two available lenses hold it back from fully exploiting that. Yes, I know I can use the EOS adapter to use regular Canon DSLR lenses, but that adds more size and weight, and now we're really starting to move away from "entry," plus we're not getting DSLR focus performance for the money, either. Close, but the cigar isn't lit. The Samsung is a camera I enjoyed and it, too, accompanied me to Alaska this year. I'm very happy with the image quality out of this camera. The body's a little bigger and the material it's made from too slick, though. The WiFi is a nice addition, but it's modal (you don't shoot with WiFi active and have the camera automatically move images). There are gimmicks in the pantry: the iFn button is less useful than Samsung markets it to be. One big drawback that hurt it in this year's voting was the kit lens: unstabilized and a bit restrictive. Yes, you can put a stabilized version on the camera, but then we get the APS curse: bigger and heavier. Plus you're buying something beyond the entry kit. Closer, but the cigar still didn't light. The Olympus E-PM2 is a bit of a dual personality: superb image quality, but a low quality feel to the rest of it. The whole "menu" system feels artificial and a bit condescending to me. The actual menus are hidden behind a facade of graphic/photo oriented handholding. That might seem fine for a while, but it gets old fast. Like the other Olympii, in the default settings you have to watch out for the "accidental setting" happening. To me, that's a no-no in an entry camera. Set easily and stay set, please. As a backup to a higher end Olympus m4/3 camera, the E-PM2 makes pocket sense (both in the pocketbook and pocketable sense). But as a compact user moving up to mirrorless entry? Not so much. Cigar almost lit, but fizzled. All of this year's nominees are good cameras. One of the three that didn't win might be better for you if you have a specific need. But after a lot of use of these cameras, I found I kept coming back to one: the GF5. 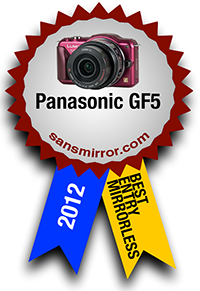 So congratulations to Panasonic on the GF5, my choice for this year's award. I actually have even higher hopes for the upcoming GF7 (Panasonic will skip the 6 number for superstitious reasons). Stick in the GH3 sensor and add a useful feature or two, and Panasonic should have another winner.